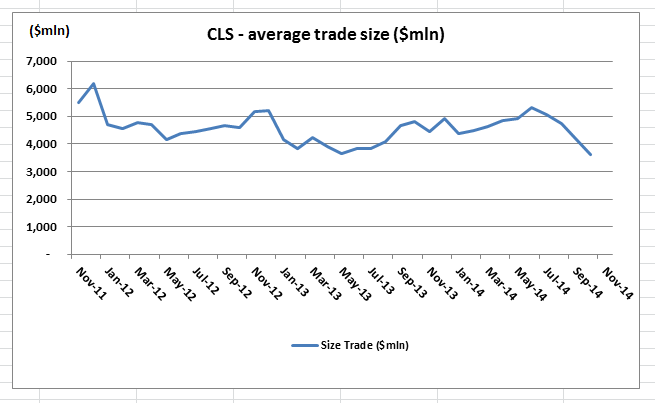 The CLS settlement system has reported a -10.9% drop in the average daily value of FX trades settled through their platform in October 2014 compared to the record set in September, which is in-line with similar drops seen in Thomson Reuters and Hotspot volumes (although EBS bucked the trend with a 10pct rise). However, whilst the value of trades has dropped, the number of instructions submitted was up 3.2% at a new record of 1.465mln instructions/day. CLS value of instructions submitted: $5,29bln/day, down -10.9% on the record $5,940bln/day in Sep 14, and some +5.8% up on Oct 2013 level of $5,000bln/day. CLS number of instructions submitted: 1,465,105, set a new record which was up +3.2% on the 1,419,102 in Sep 14, and some +41.2% up on Oct 2013 level of 1,038,584. Average Trade size: $3.61mln was down -13.7% on the $4.18mln in Sep 14 and down -25.1% compared to the $4.82mln in Oct 2013. 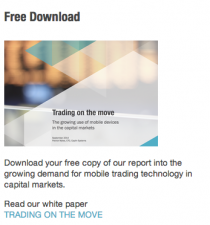 The lower average trade size reflecting the increased flows via e-trading channels, where higher volumes are generally accompanied by lower average trade sizes.